When writing a thank-you letter, you may think it's the middle of the note — the part where you express gratitude in a personable and specific way — that’s the most challenging section to compose. That may be true, but the way you close your thank-you letter is important and shouldn’t be overlooked. 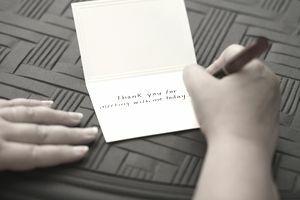 Thank-you letter greetings and closings may not seem critical, but they help form a well-written letter, so when it comes to thank-you letters, the formalities are also important. That's because letter readers have certain expectations of the style and tone of your letter. You should always include a polite closing, as well as an appropriate greeting, in a thank you note, letter or email message. The close of your letter is a formal way to echo the appreciation you expressed throughout the body of the thank you note. It’s the part of the email that may leave a lasting impression. Whether it's a simple "Thank you" or a more formal "Thank you for your assistance in this matter," the closing statement in your thank you note should always be followed by a comma. Then, skip down a line and write out your name. If you’re writing a letter that you’ll print out and mail, leave two spaces in between the complimentary closing and your typed name. This is where you will sign your name in ink. The degree of formality you employ will depend upon your recipient. If they’re a friend or an acquaintance you know personally –- or even a job interviewer with whom you felt that you established a good rapport –- it’s fine to use the warmer tone. If, however, you’re thanking a business associate or someone you have never met, the more formal, conservative phrases should be used. Read through your entire letter and try to think what tone you're conveying in order to help you select the right closing sentiment. Salutation: In the same way that it's inappropriate to close a business letter with "XOXO," you'll want to make sure that your opening greeting is not too casual or familiar. There are various salutations you can use, including the most common option, "Dear." Say thank you: This may seem obvious, but you'll want to open your thank-you letter with appreciation — if you’re writing a thank-you letter following a job interview, be sure to thank the interviewer for giving you the opportunity to interview, and for taking the time to chat about the nature and requirements of the position. Make a case for your candidacy: While courtesy is the biggest reason for your thank you note, the letter is also an opportunity to ​remind interviewers why you are a strong candidate. Use the body of the email to reiterate your relevant skills and experience. Callbacks to the conversation are helpful here. Ideally, your thank you note will feel specific to the position at hand, and not generic. Reiterate your thanks: Close your letter by thanking the recipient once again. The following is a sample letter that is printed or sent as an attachment. If you're sending an email message, include your contact information after your typed name. Thank you for taking the time to interview me for the open bartending position at Antonio’s Steakhouse yesterday. I enjoyed speaking with you and Mr. Tortelli, the owner. Based on the interview and my experience as a customer, Antonio’s appears to be a great place to work. I would make an excellent evening bartender due to my past experience in bartending as well as the other restaurant positions I’ve held over the years. Plus, I have all the skills needed for a job in the hospitality industry, and I enjoy working with people. In fact, at my current job, I was awarded employee of the month in June of this year. Thanks again, and if you have any questions, please do not hesitate to contact me. My cell phone number is 555-555-5555 and my email is myname@myemail.com. I look forward to hearing from you.